If you’re looking for accuracy and ease of use in a bathroom scale, then this mechanical scale fits the bill. This Health-o-Meter classic beam scale Enjoy the same consistent results you’d get at the gym or in your physician’s office. 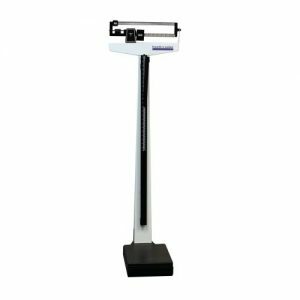 This scale is great for people who have a lot of weight to lose, since it weighs up to 402 pounds and has a durable steel lever system that can handle even the heaviest users. The balance beam design makes it easy to measure your weight down to the nearest ¼-pound increment, and having the numbers in front of you makes it easier to read than trying to read a dial or digital floor scale. Pricewise, this scale is moderately expensive, especially when compared with traditional bathroom scales, but well worth the investment, especially for larger people who tend to get inaccurate results with spring-style scales. This scale also takes up a little more room than conventional bathroom scales, so buyers should take that into account prior to purchase. This scale requires no batteries to operate, which makes maintenance simple, and because there are no circuit boards to worry about getting wet, it should live up to every year of its 10-year warranty without any hiccups.